I finally have my own website. It's here. Sorry for the late reply - I didn't see the discussion here - your about me looks normal to me, does it still look weird to you? The feature request on improving the about me format already exists by the way. @Dilaton See now. Alternatively, see http://i.imgur.com/SmMZv2c.png. what exactly did not work when you tried to put down your Math SE profile here (probably many things)? Maybe the possibility to put information into the About box could be improved by increasing the number of allowed characters and using the Editor we have for all posts to allow for LaTex etc ...? Probably more people would be interested in this and it could make a good feature request ? 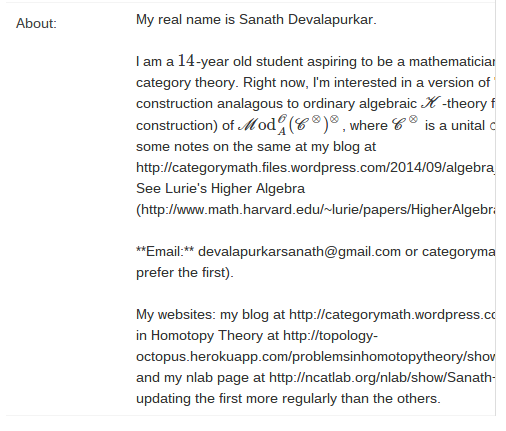 Dear Sanath Devalapurkar, the posts you accidentally posted anonymously are now added to your user, so your reputation points are with you now. @Dilaton Meanwhile, is it possible for me to able to get back the reputation that I was supposed to get but was not able to, as three of my questions were posted without being registered, as you said in a previous wall post. @Dilaton, @dimension10 Yes, I am able to log in now. Apologize for the (extremely) long delay.